Why does “Family Orthodontics” have a Kids' Club? 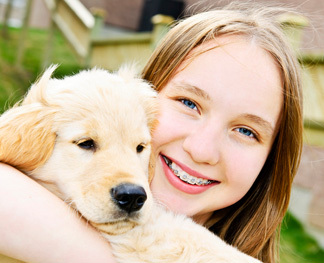 When most people think of orthodontics, they think of teenagers, and the fact is, most orthodontic treatment begins between the ages of 9 and 14; however, by age 7, most children have a mix of adult and baby teeth. The doctor can evaluate potential problems with jaw growth and emerging teeth while some baby teeth are still present. That is important because some orthodontic problems are easier to correct if they are found early. For these reasons, the American Association of Orthodontists recommends that your child receives an orthodontic check-up no later than age 7. The majority of our young patients will not require immediate treatment and the doctor will take a "wait-and-see" approach in which she will regularly check on the development of the permanent teeth, jaw, and face.The Family Orthodontics Kids' Club is designed for these young patients in active 6 month observation appointments at Family Orthodontics. The Kids' Club will assist your child in becoming more comfortable and knowledgeable about orthodontic treatment when in fact they begin. We want all of our patients to feel like they are a part of our office, even if they are not in treatment. How much does the Kids' Club cost? At your child's routine appointments, his or her growth and development will be monitored until the optimal time in growth has been reached to begin orthodontic treatment. Digital radiographs and diagnostic records (if recommended) are included in your 6 month observation appointments and there is NO FEE associated with the Kids' Club program. How does the Kids' Club work? It's so easy! If our doctors do not recommend immediate treatment during your child's initial examination, he or she will receive a membership card. At each 6 month observation exam, show us your membership card and get entered in our reward drawing, happening every six months, and your child could win the a gift such as a GameStop Gift card or an I tune card or a Toy’s R Us card! The best part is by showing up at your routine appointments, you win a special reward every time! The rewards are the coolest. So put your membership card someplace special and don't forget to bring it with you to every appointment. It's worth it! Bring your young child in for an initial evaluation at your convenience or bring them with a family member in treatment, we'd be happy to help them join the club! The appointment will take about an hour in which we will take digital radiographs, discuss potential problems to watch, and possibly take diagnostic records.